At the Feb. 19 Special City Council meeting, staff reported on the federal regulations pertaining to wireless-communication facilities. In conjunction with the staff's report, Telecom Law Firm, PC made a presentation to the council to further explain the new federal regulations and the limitations they place on local authority to regulate small cell wireless facilities linked to proposed 5G wireless technology. Following a series of questions and public comments, the council directed staff to prepare an urgency ordinance and aesthetic standards for wireless facilities. 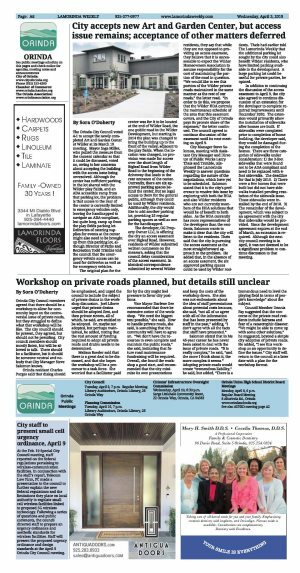 Staff will present the proposed urgency ordinance and design standards at the April 9 Orinda City Council meeting.